Corcoran, Inc. Stoughton, Mass. Hunting, Camping and Fishing Specialties. Fall and Winter Catalog 1964. A 68 page catalog in B&W. Nice. . Bagged & Boarded for Posterity. L. L Bean, Inc. Catalogue - Fall 1960 - Whitetail Deer Front Cover . 106 page color and B&W illustrated catalog. Minor old water evidence. Nice looking color illustrated covers. Deer on front, Hudson's Bay striped woolen blanket on pine camp bed to rear, very classically rustic. 106 page color and B&W illustrated catalog.. Bagged & Boarded for Posterity. NY: Houghton Mifflin & Co.,, 1910 A scarce 1st US printing of this classic/ Rust cloth bds with white titles. End papers foxed, owner name on top of 1/2 title, all else near fine. 288 photo illustrated pages, dated 1910 on title page. . First US Edition. Near Fine. Bagged for Preservation. L. L Bean, Inc. Catalogue - Spring 1960 - Bear Family Front Cover . 106 page color and B&W illustrated catalog. Minor old water evidence. Nice looking color illustrated covers; Bear family on front, Bean's Trout and Salmon Flies to rear. 106 page color and B&W illustrated catalog.. Bagged & Boarded for Posterity. Northern Publishing, 2004 Northern Publishing, 2004. Condition: like new, near fine. 280 illustrated pages. NOTE: We have this book here in the store, not in some warehouse a thousand miles away!. We have this book here in the Store.. Sport in Abyssinia; or The Mareb and Tackazzee. First Printing, 1876. London: John Murray, 1876 Quite worn with spine cloth 1/2 missing, the resr loose. Library plates on the front cover (Mudie's Select Library, Museum Street, London), verso (Thorold Mechanics' Institute Library & emboss stamp on title page), rear end paper and verso of cover (due date slip and pocket, both clean/no ink writing.) 5 illustration plates by Whymper, and 252 text pages, includes the 32 page publishers catalog in the rear dated: January, 1876. A good candidate, of this highly scarce first printing, for rebinding. NOTE: Friends, this is NOT a common reprint.. First. Hard Cover. Fair. 8vo. Bagged for Posterity. Reykjavik: Bokautgufa Gudjonso , 1975 221 photo-illustrated pages, 2 colored folding maps, large. Text in Icelandic. Salmon fishing in Iceland with a history of a certain area. .
Howe , 1937 140 largely illustrated catalog pages. Includes the original (unadulterated) order form and mailing envelope. Nice!. Bagged & Boarded for Posterity. New York: Abercrombie & Fitch, 1959 32 illustrated pages. Includes the original order form 4 pages atached in the center. . Very Good. Bagged & Boarded for Posterity. State of New Hampshire - Biennial Report of the Department of Fish and Game - July 1st, 1946 to June 30th, 1948. First Printing, NEAR FINE. Concord, New Hampshire, U.S.A.: State of NH, 1948 91 Illustrated pages. . First Thus. Titled Red Wrappers. About Fine. Illus. by Assorted. 8vo - over 7¾" - 9¾". Bagged for Posterity. State of New Hampshire - Biennial Report of the Department of Fish and Game - July 1st, 1936 to June 30th, 1938. First Printing, NEAR FINE. Concord, New Hampshire, U.S.A.: State of NH, 1936 198 Illustrated pages. . First. Titled Red Wrappers. Near Fine. Illus. by Assorted. 8vo - over 7¾" - 9¾". Bagged for Posterity. State of New Hampshire - Fish and Game Department. Preliminary Biological Survey of Some New Hampshire Lakes By Earl K. Hoover - Survey Report No. 1. First Printing, NEAR FINE. Concord, New Hampshire, U.S.A.: State of NH F&G Department, 1936 77 Illustrated pages + index. Scarce, map reproduction of Granite Lake, 1904. A very scarce publication with information not found in any ofter source. . First Thus. Titled Red Wrappers. Near Fine. Illus. by Assorted. 8vo - over 7¾" - 9¾". Bagged for Posterity. State of New Hampshire - Biennial Report of the Department of Fish and Game - July 1st, 1940 to June 30th, 1942. First Printing, NEAR FINE. Concord, New Hampshire, U.S.A.: State of NH, 1942 48 Illustrated pages. . First Thus. Titled Red Wrappers. About Fine. Illus. by Assorted. 8vo - over 7¾" - 9¾". Bagged for Posterity. RI Department of Natural Resources 96 pages of info, graphs and fish statistics. Quite scarce. . Bagged for Posterity. By Cronan, John M. Jr.
1958 40 illustrated pages, about fine in dark green wrappers, appears new. . About Fine. Bagged for Posterity. On the Track - First Edition, Signed By the Author. 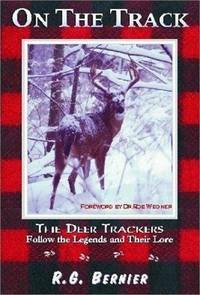 Big Whitetail Consultants, 2002 Authors Inscription on front free end page " May Your Journey Be Reflective on the Track" and Author's Signature, dated 04. 363 photo illustrated pages. . Photo Illustrated Stiff Wraps. Near Fine. Bagged for Posterity. Bobwhite Quail Book - First Hardcover Signed Limited Edition, 1980. Fine Reasonable Cost as Well! Amwell Press, 1980. Full-Leather. Book Condition: As New. Donald Shoffstall (illustrator). Signed, leather. 8vo - over 7¾ - 9¾" tall. Foreword by Gene Hill. Drawings and color frontispiece by Donald Shoffstall. First edition, un-numbered example, limited edition (sure?!) of 1000 copies. Signed by the author, illustrator, and Jim Rikhoff. As new: gilt-stamped bonded green leather. Contributors include Havilah Babcock, Robert Ruark, Larry Benoit, William Faulkner, Theodore Roosevelt, Ted Trueblood, and Archibald Rutledge, among others.. The Best of Colonel Townsend Whelen - Signed Limited Edition, Leather Hardcover, 1983. AMwell, 1983 The Best of Colonel Townsend Whelen. Limited edition of 1000 copies, this one is un-numbered and signed by Angier & Rikhoff. Full red leather with silk page minder. 404 gilt-edged pages, illustrated. Big Game Collection Fifth book. . Bagged for Posterity. U.s.a.: Moose Country Pr, 2003 264 illustrated pages. . Near Fine. Bagged for Preservation.